Simon & Schuster/Paula Wiseman Books, 9780689868665, 40pp. Young Hewitt Anderson is his parents' pride and joy, and they love him so. Hewitt is sweet, smart, polite -- everything a boy could be -- except Hewitt is small...very small...teeny-weeny, in fact. Descended from a long line of giants, the J. Carver Worthington Andersons take their height very seriously indeed. You see, without exception all of the many J. Carver Worthington Andersons have been giants until now. And poor Hewitt -- hidden in the floorboards, trapped in the flour vat, lost in the bedsheets -- has his struggles being tiny. Oh, his parents worry: How will their son manage to live in a world of big things? Leave it to Hewitt to prove the power of being small. Inspired by the tale of "Jack and the Beanstalk," the inimitable Jerdine Nolen tells an original story of bravery and the power of the individual. 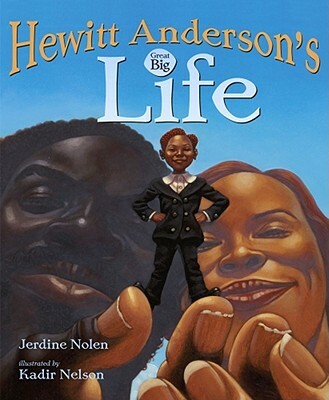 Kadir Nelson's imaginative and loving illustrations create a world where smallness rules -- a world that children will want to return to again and again.